Lightly beat the egg yolks and stir them into the melted chocolate. At first it will look as though it has split, but keep stirring until the mixture cools to room temperature; it will become thick and glossy. Gently incorporate the beaten egg whites, folding in a third to loosen the mixture, then lightly folding in the remainder with a rubber spatula until everything is well combined. 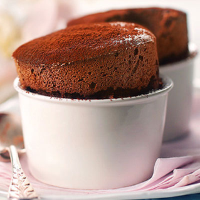 Fill the ramekins to the top with the mixture and cook for 7 minutes. Serve immediately. This recipe was first published in Mon Feb 01 00:00:00 GMT 2010.